In the Tales of Sasha series debut, Sasha discovers that she really isn't like the other horses in her valley when wings sprout from her back and she soars through the air! 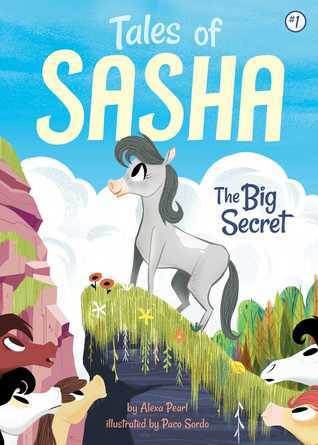 In the first book of Tales of Sasha, readers meet Sasha, a kindhearted young horse who has always felt a little bit different from the other horses in Verdant Valley. For starters, she looks nothing like her two older sisters, Zara and Poppy, who are black and brown while Sasha is pale gray—except for a small white patch on her back. Sasha also loves running and jumping and the feeling of being in the air, and she longs to explore the forest beyond her valley. Sasha is shocked and decides not to tell anyone. She wonders where she came from, and she gets the idea that perhaps it was somewhere closer to the sky, like the top of Mystic Mountain! She convinces her better-than-best friend Wyatt to climb the mountain with her, and while they’re playing follow-the-leader Sasha jumps too far over a bush and ends up going off the cliff! But much to her surprise, she doesn’t fall. Instead two huge wings sprout from the white patch on her back, and she’s able to soar over the mountain. She wonders if her birth parents could fly too, and decides it’s time for her to set out and find them. With easy-to-read language and illustrations on almost every page, the Tales of Sasha chapter books are perfect for beginning readers. Being an avid horse lover, I was anxious to read this series as soon as I heard about it. And I wasn't disappointed exactly, just a bit let down. I guess I was expecting a bit to much from this early chapter book series. And despite my own feelings I have no doubt that young readers who love horses will adore this series. After all, Sasha is a spunky young horse who just can't walk sedately like all the others. Even her sisters, Zara and Poppy, don't quite understand Sasha. Luckily she has a best friend, Wyatt, who is more than willing to set off on an adventure with her, and she discovers to her shock that the white spot on her back produces wings. The many black-and-white illustrations break up the text nicely, making this a nice read for readers who are just moving into chapter books. This is a series that I will be adding to my library because I am positive that it will be well-loved by the horse-loving crowd. 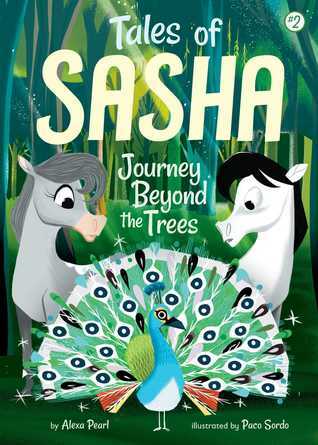 In this second book is the Tales of Sasha series, Sasha, her best friend Wyatt, and their teacher Caleb journey into the forest to try and find where Sasha came from. Sasha has finally discovered what makes her different from her friends and family—she can fly! Determined to find other flying horses like her, Sasha sets out on a magical journey beyond the trees that line her valley, with the help of her teacher, Caleb, and her better-than-best friend, Wyatt. Picking up where the first book left off, Sasha, a young filly, has just discovered that she has wings, and that she was adopted by her parents. Naturally, this creates a great deal of curiosity for Sasha about where she came from, especially when her teacher tells her that he once knew a horse that could fly. Sasha sets off with her best friend, Wyatt, through the forest that she's been told her whole life to avoid. The forest rejects Wyatt, but opens up for her, encouraging her to continue her journey with Wyatt holding tightly to her tail. The black-and white illustrations are adorable and bring Sasha and her friends and family to life nicely. The text is broken up by these illustrations making this a nice book for young readers just getting into chapter books. A series that is bound to be popular with horse-loving youngsters.